New Surface is one of the coolest products Plaster Paint has! It’s job is to help your paint adhere to whatever surface you choose. New Surface can be applied to any piece of furniture, glass, metal, or wood, arborite counter tops, old marble, tile, slick surfaces, gloss finishes, varathane finishes, high gloss paints…the list goes on. All that’s needed is one light coat before you paint and BAM, you’re ready to start painting. And yes, this also means you DO NOT need to sand first. 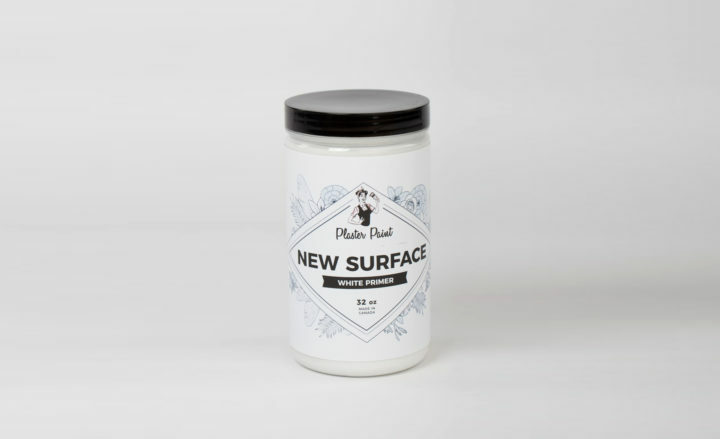 New Surface is one of the coolest products Plaster Paint has! It’s job is to help your paint adhere to multi surfaces. New Surface can be applied to any piece of furniture- glass, metal, wood, arborite counter tops, old marble, tile, slick surfaces, gloss finishes, varathane finishes, high gloss paints…the list goes on. New Surface also eliminates the need to sand…yippee!! ***Watch this video on ‘How to tell if you will need to prep your furniture piece for refinishing‘. Clean piece with soap & water. Allow to dry, then all that’s needed is one light coat before you paint. And yes, this also means you DO NOT need to sand first. If your paint is peeling off it’s telling you one of three things: 1) your furniture piece is either too slick, not allowing the new paint to stick; 2) it’s been oiled and is greasy; or 3) your piece is painted in a alkyd (oil-based paint) not allowing a water-based paint to stick to it. 1. Remove dust and grease by washing with soap and water. Allow to dry. 2. Open your new surface jar and lightly mix. 3. Take one of your plaster paint natural bristle brushes and load it with New Surface. Don’t be afraid to get a good amount on your brush. 4. Begin painting your new surface right over top of the old paint, glaze, or whatever sealant is on your piece. Don’t be afraid, it will stick to it! Make sure you are painting in the same direction with back and forth motions. If you can see the wood grain, try to follow that direction. Apply one liberal coat. 5. Check for drips on sides. 6. Once you have one coat of New Surface on, allow to dry 30-35 minutes. 7. Usually one coat of new surface should be enough but if you have a high-oiled piece, 2 coats is recommended just to make sure you fully block the oil from coming through. New surface can also be used to block colour from coming though. If you have a bright or dark colour you want to cover with a lighter one, it sometimes is hard to cover that old colour up. New surface can completely block that colour and allow you to start fresh with your new colour, similar to a primer. Synthetic (nylon, polyester or blend) bristle brush, roller, or sprayer. Not recommended for applications to floors.